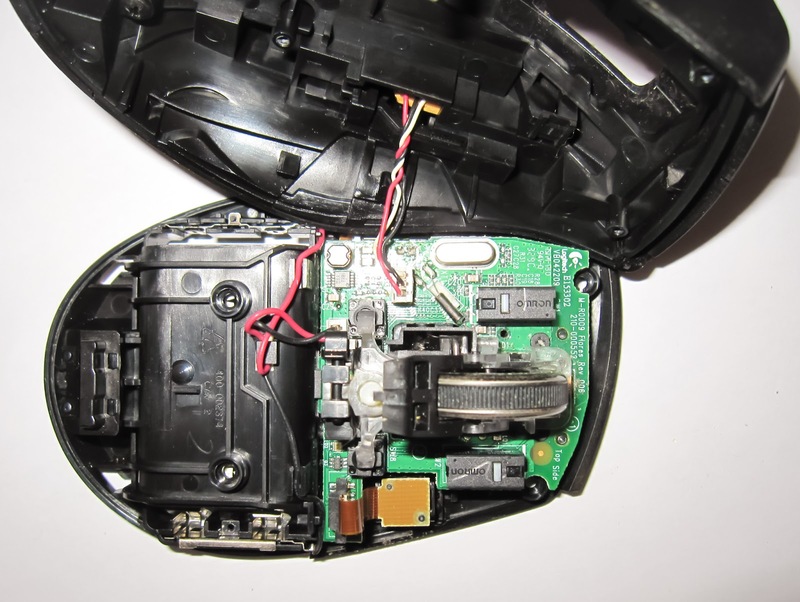 Some weeks ago I fixed my Logitech LX6 mouse, this week came time to fix my Logitech M705 Marathon mouse. 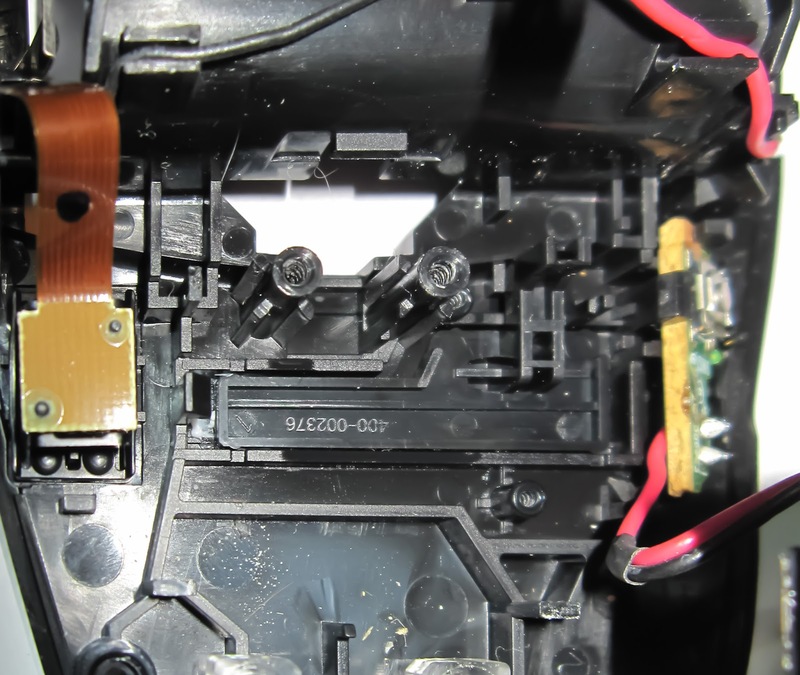 The plan is the same as for the LX6 fixing... but this time I used a dremel to loose less time in desoldering/removing the switches. 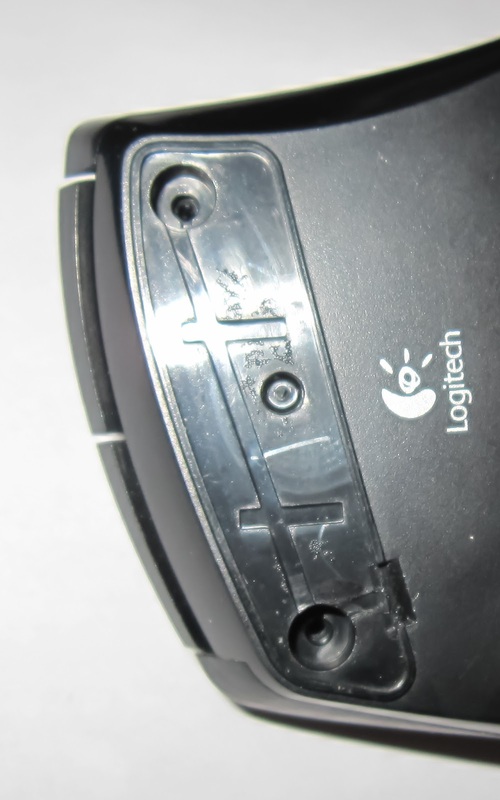 I must say that the disassembly of Logitech product is always interesting, I think them are very well engineered. 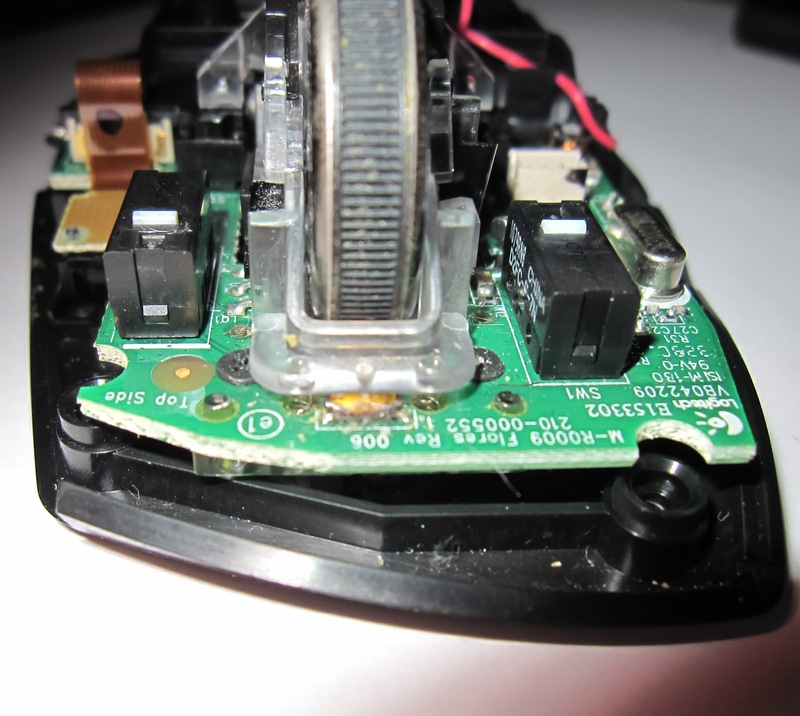 Here we go with some detailed photos of the Logitech M705 internals. First, there are the screws, 5 screw to be precise. 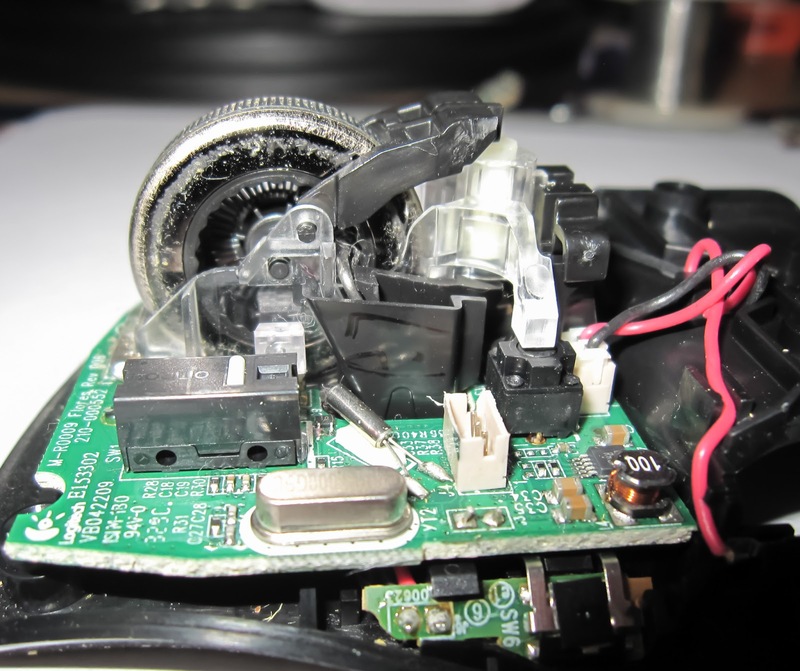 The assembly of the free spinning wheel is very well done! ...now look to the right. And here is the mechanism that switch from free-spinning, to the classical click-spinning. 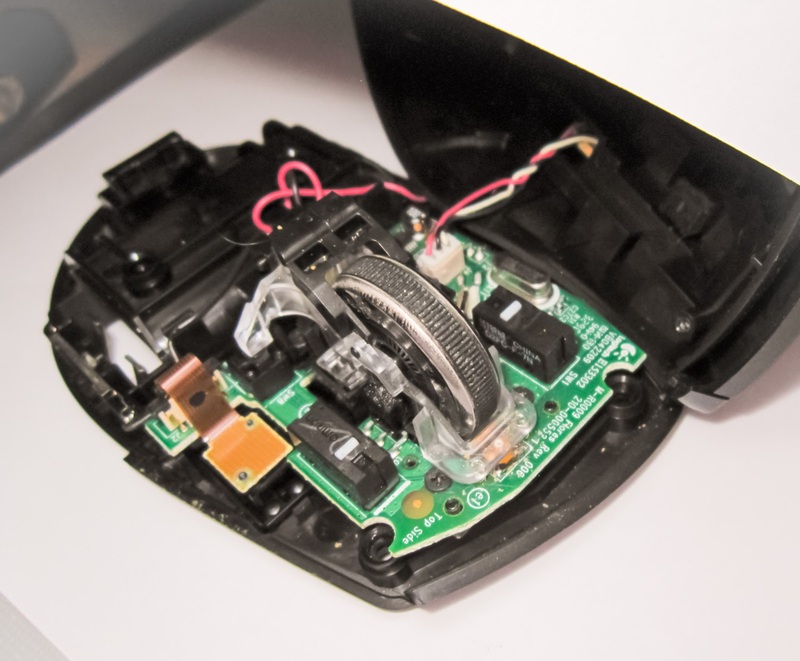 When you push the button on the mouse, there is a tiny hook that engage the notch inside the wheel. Here the hook is engaging the notch, and the wheel is in the classical click-spinning mode. 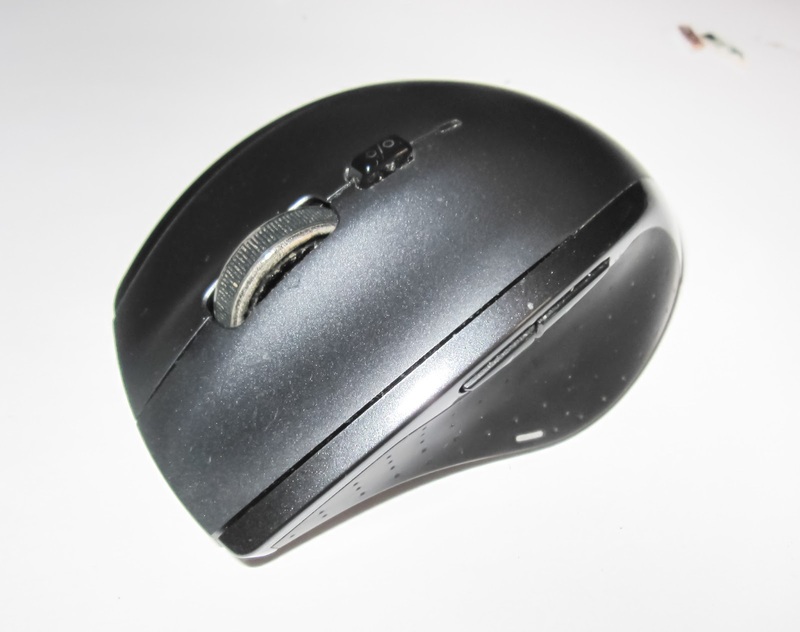 In this other image the hook is disengaged, and the mouse is in free spinning mode. 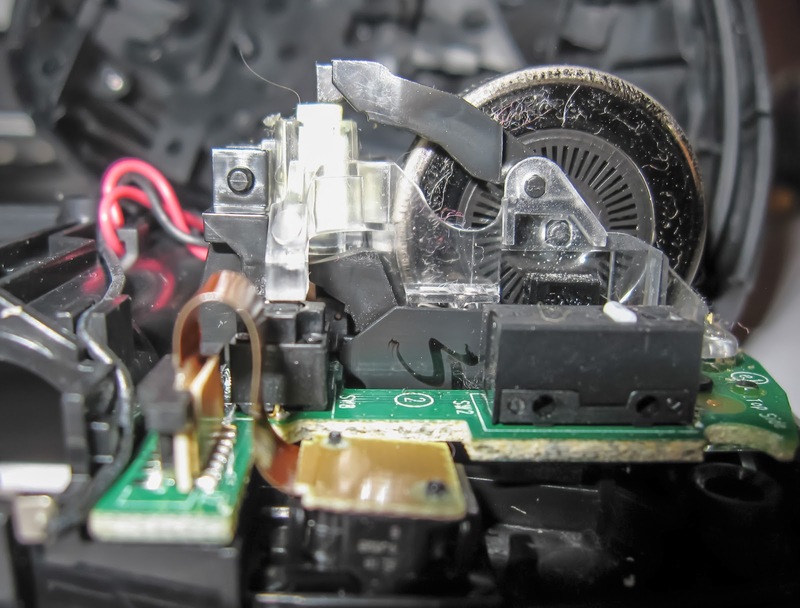 Another view of the wheel, and the switch. 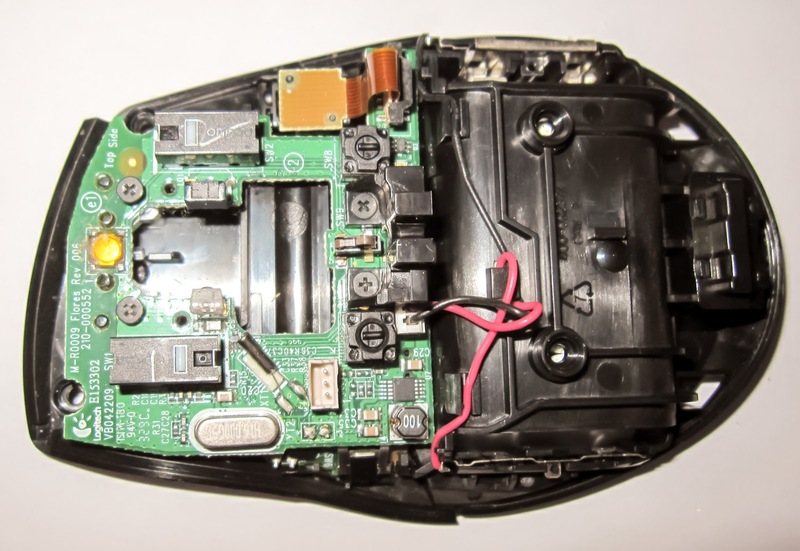 The broken one is the switch of the left mouse button. 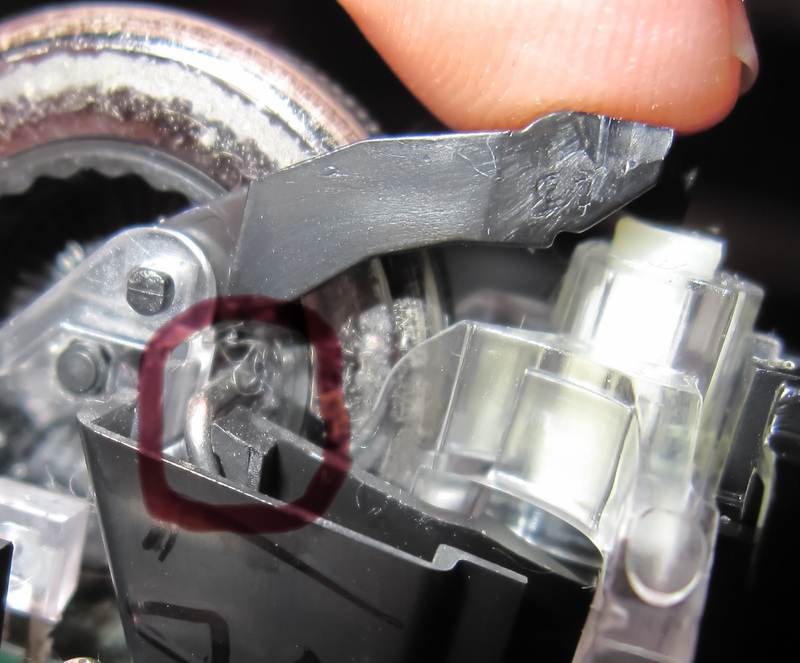 Now came to the interesting part: how do we remove the wheel assembly? It turned out there there is a tiny plastic pin that hold it in place. ...you will be able to lift and remove the wheel assembly! ...and establish that the board is still firmly locked to the case. 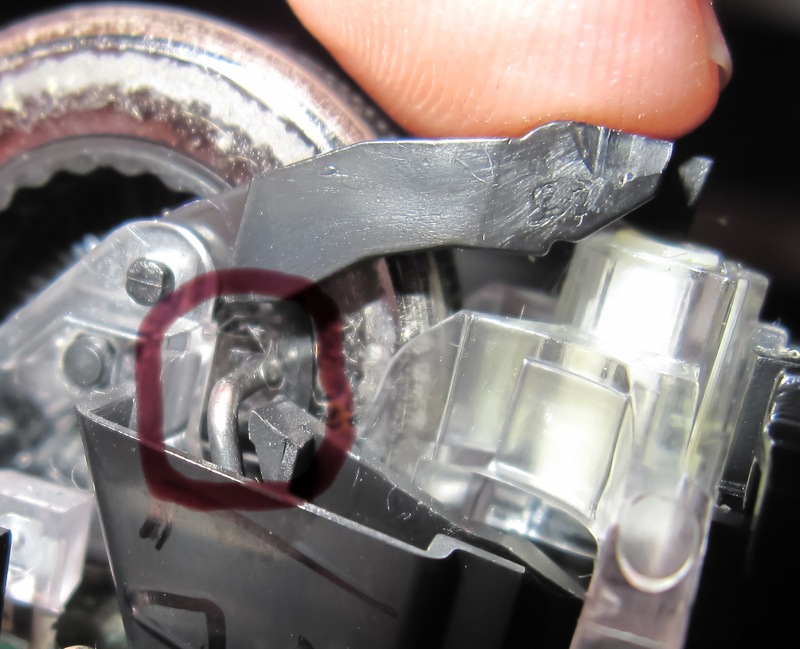 ...but first you need to take care of these 2 tiny spring, they will keep the wheel stright, so don't loose them. They are just placed in their hole, so gently lift hem and put them in a safe place. I use some tiny neodymium magnet to hold all the different screws/spring in a safe place. 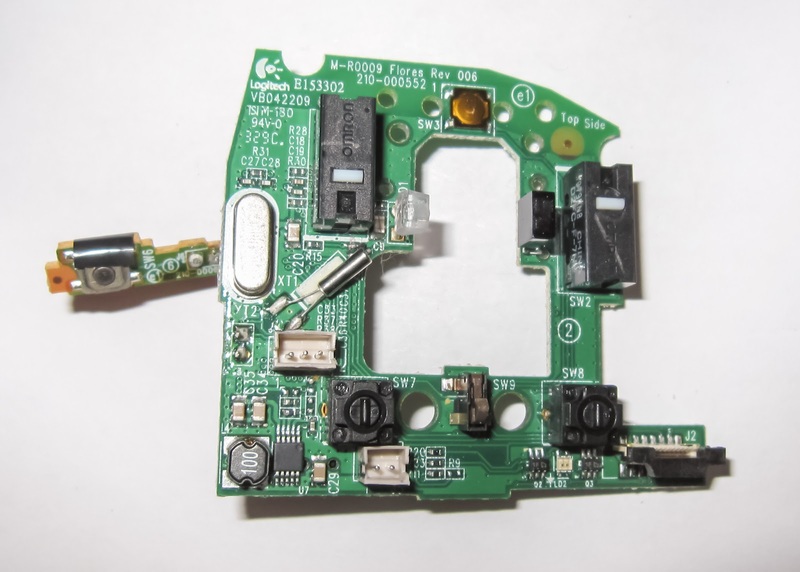 Then get a tiny screwdriver, and remove these 4 screws: you'll find out that these screws are STRONGLY tightened to the board. 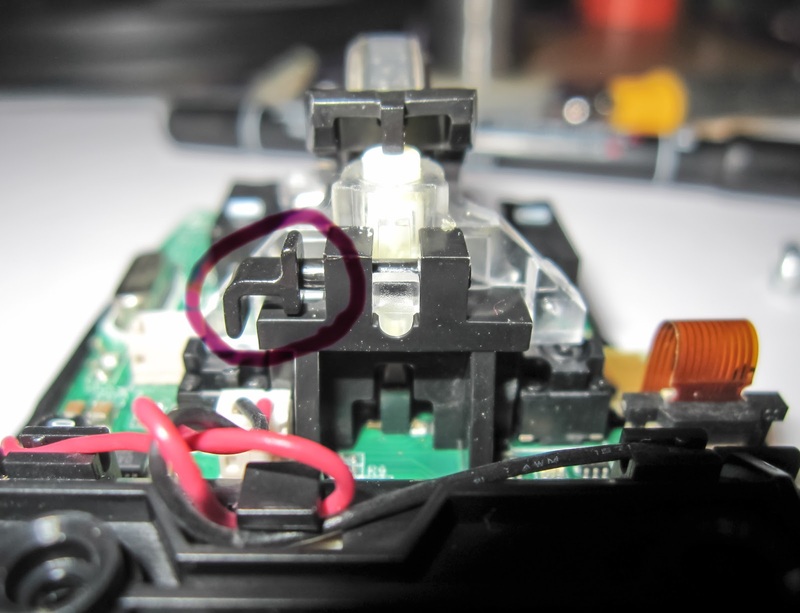 I thought I can remove it, but ther is more under the board: there is a tiny circuit for the hidden thumb mouse button. 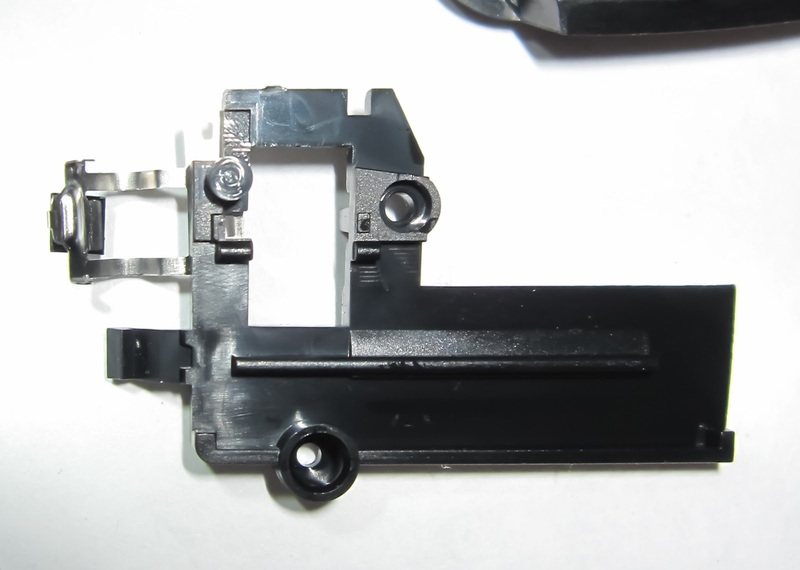 and unhook the last piece of circuit from the case. 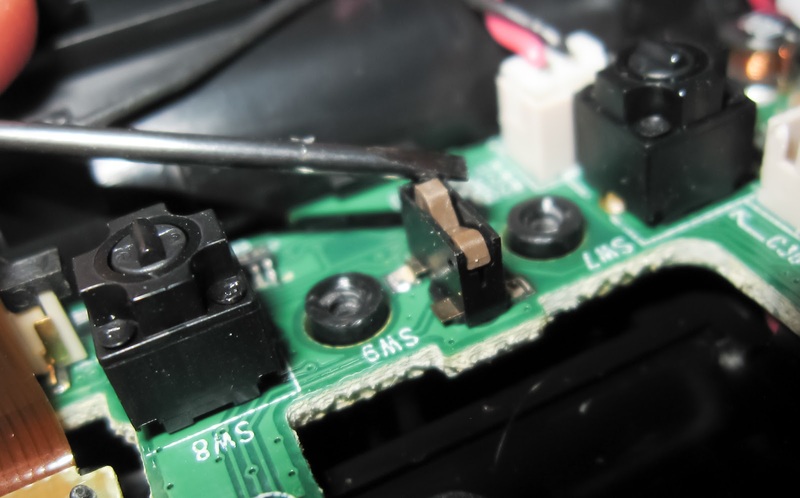 The M705 main circuit board in all it's glory! Desolder the the old broken switch. Resolder a new working switch. 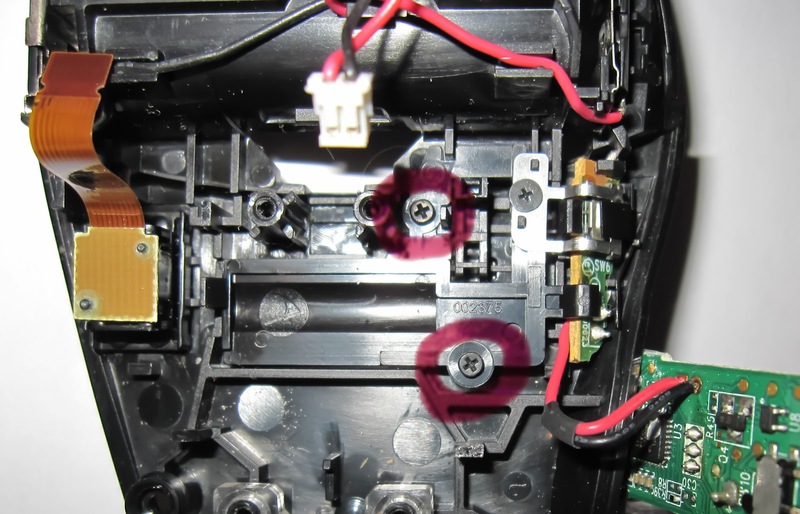 With this particular switch I've had some issue: 1 of the 3 pin war very stiff, I had to pull a lot. 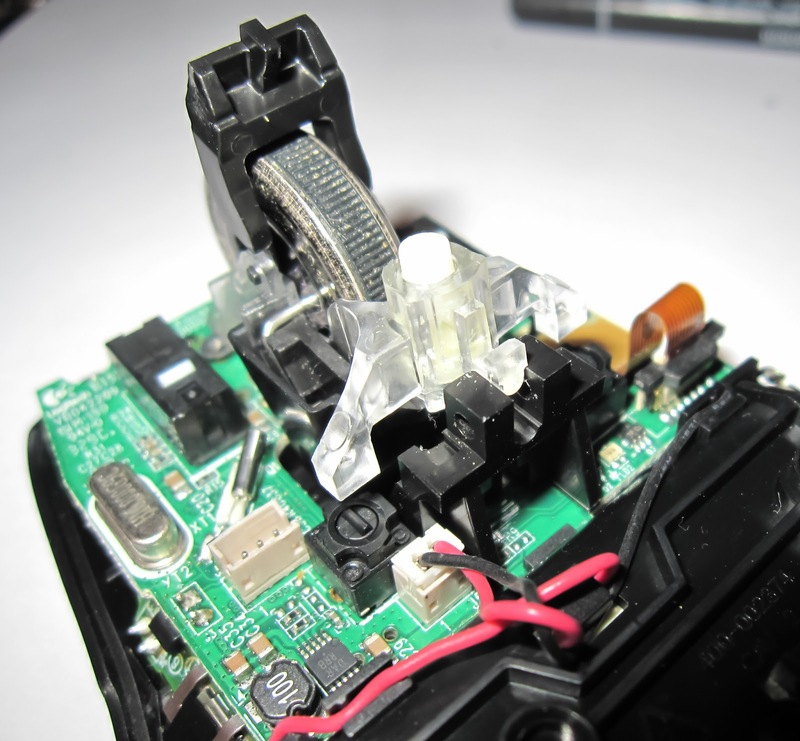 Even after desoldering and cleaning the board, it's been a complex job to push the new switch in it's place. 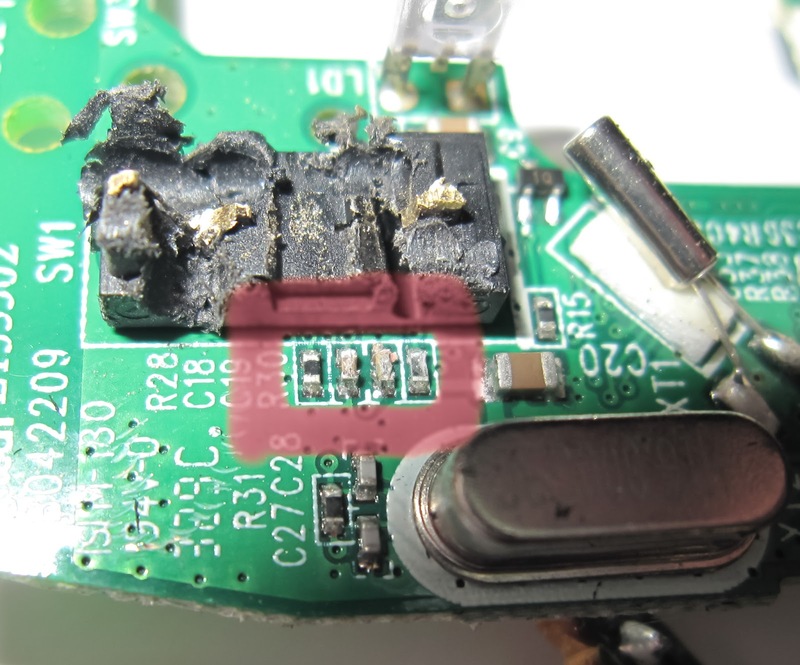 I had the feeling that I've been very near to the breaking point of the copper under the board. 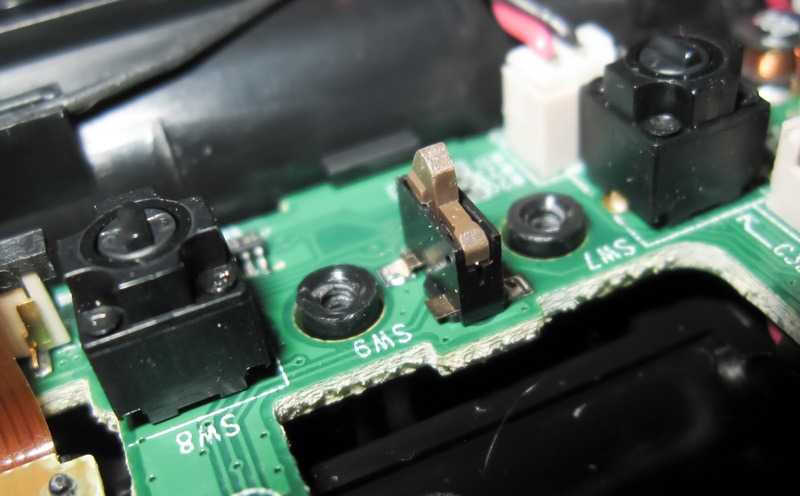 Anyway, I've eventually been able to replace the broken switch with a working one. 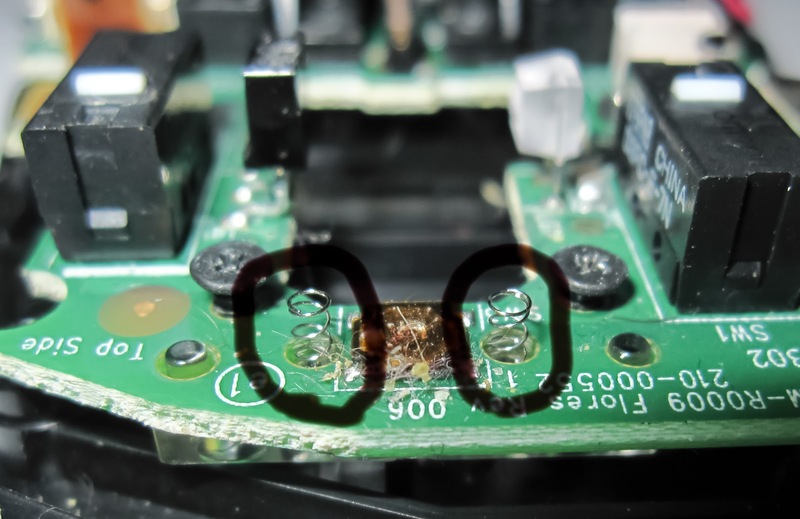 By not having a welder tip specific for desoldering, the only working way I found for removing a mouse switch is by breaking it in 3 part, and desolder them individually. 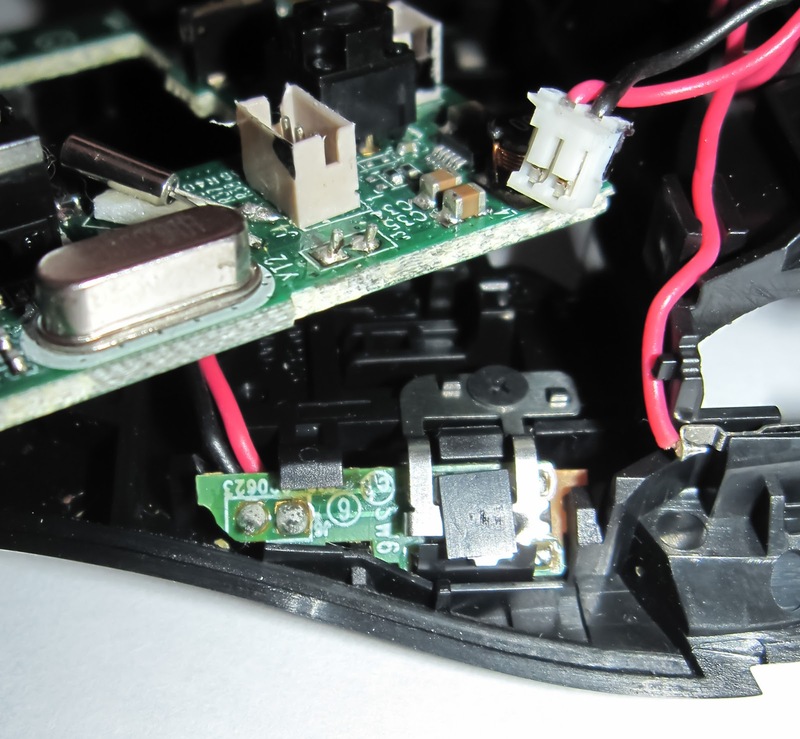 This time I tried to use a dremel to break the switch in 3 part more easly and less aburptly than by using a nipper. For the most part, the idea worked out well... but you need to pay attention when you have a 10'000 rpm spinning diamond coated 120 grit burs. 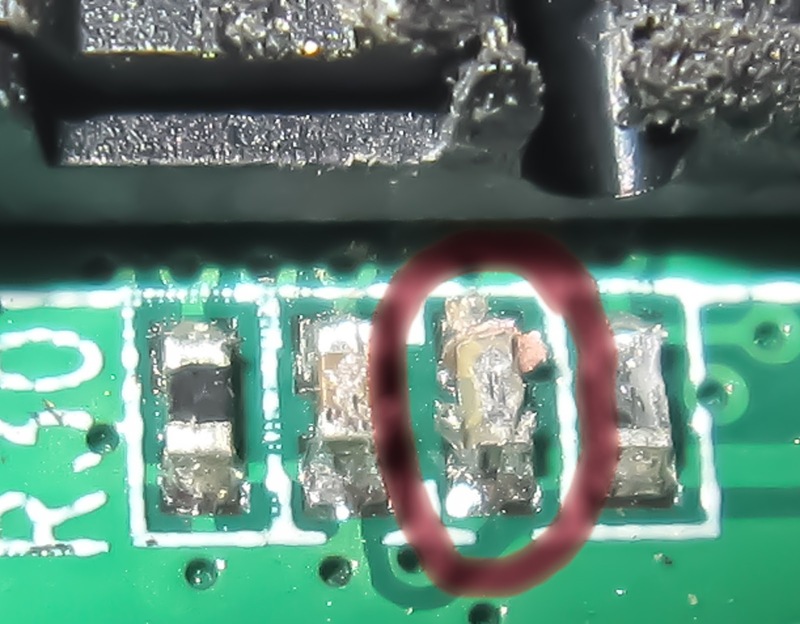 I nearly ripped off a capacitor, and damaged the soldering on the two nearby resistors/capacitors. 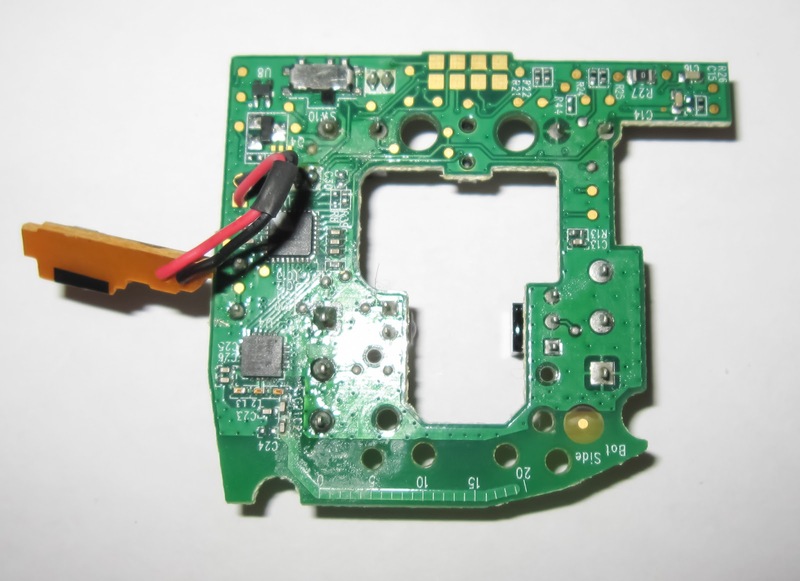 Another image or the scraped smd components. 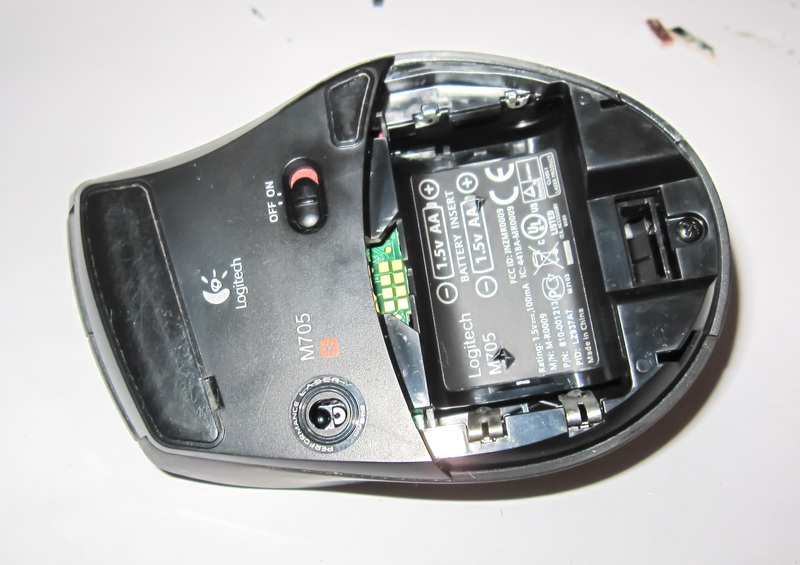 After all, I've been very lucky, the mouse still seem to works perfectly. 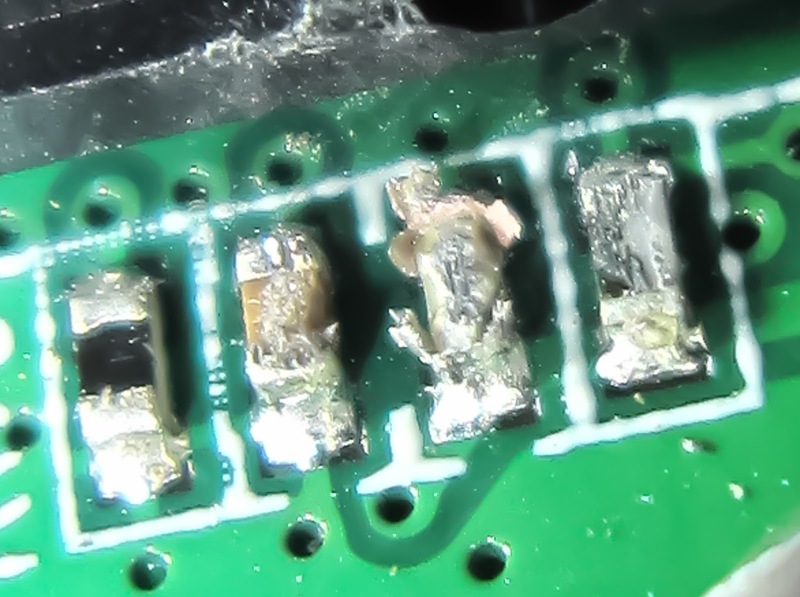 Probably there still is enough tin on the side and maybe under the smd capacitor.